Nicole Langton has been a professional writer for over 10 years. She began writing for a natural health company where she developed a deep interest in nutrition and natural treatments. Langton earned a Bachelor of Arts in east central European studies as well as a certificate in English language to teach to adults. Which Is More Nutritious: Apples or Oranges? What Is the Nutritional Value of Canned Mandarin Oranges? 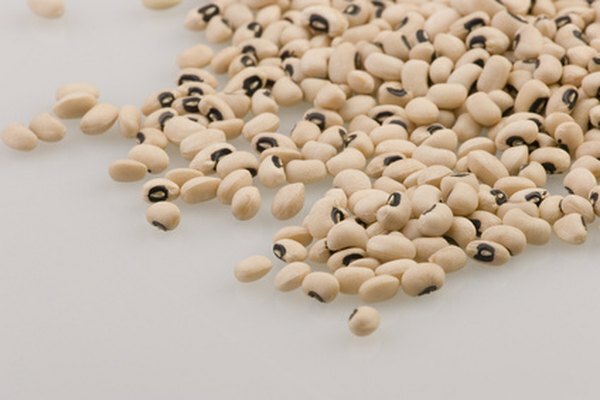 A staple food in certain warm climates where they grow, black-eyed peas earned their alternative name, cowpeas, from their use as cattle fodder. Particularly in the southern U.S., eating black-eyed peas on New Year's is a tradition said to bring prosperity in the coming year. Add black-eyed peas to soups, bake them into black-eyed pea loaf, pair them with rice or use them to dress up salads. Like many beans and legumes, black-eyed peas contain a fair amount of protein, with a 1/2-cup serving of cooked black-eyed peas providing 6.7 grams of protein. The same serving also supplies 5.6 grams of fiber. Getting sufficient fiber may help reduce the risk of certain intestinal disorders and control cholesterol levels. With only 0.46 grams of fat in a 1/2-cup serving, these peas are also low in fat. Like other beans, black-eyed peas are starchy and contain 17.8 grams of carbohydrate in a serving. You get all this nutrition for a reasonable calorie count: 99 calories. Although not especially rich in vitamins, black-eyed peas do contain a substantial amount of folate. From your 1/2-cup serving of cooked black-eyed peas, you can get 179 micrograms of folate, which is almost half the daily amount you need of this nutrient. Folate, which helps with cell formation, is especially important during pregnancy. Black-eyed peas also contain about 12 percent of your daily amount of thiamin, one of the B vitamins. Black-eyed peas are a modest source of potassium. A 1/2-cup serving provides 239 mg of this mineral, or 5 percent of the recommended daily intake. Potassium is critical for keeping the muscles, including the heart, working properly. The same serving of black-eyed peas also contains 2.2 milligrams of iron or about 12 percent of the recommended daily intake. In some areas, you may find fresh black-eyed peas in season. If not, though, dry, canned and frozen varieties are also easy-to-find options in most grocery stores. If you opt for dry black-eyed peas, look for ones that have some shine. To avoid excess salt in canned peas, choose those with no added salt. Alternatively, drain canned black-eyed peas and rinse off excess salt by cleaning the peas under running water, suggests Sam Montel, a nutritionist with the UK Food Standards Agency. In the U.S. Department of Agriculture's food pyramid, black-eyed peas fall into both the vegetable group and the meat and beans group. Either way, you count them, a 1/2-cup serving of cooked black-eyed peas counts as one serving. What Are the Health Benefits of Nashi Pear? Is There Any Nutritional Value in a Peeled Cucumber? Can You Eat Avocados Every Day? Are Potatoes Bad for Your Diet?